River Semuliki is a major source of livelihood for neighbouring farming communities as it provides water for livestock and crops but, it is also controversially referred to among the same communities as the “river which eats our land” The reason for this sentiment is the gradual loss of land due to collapsing river banks. The river,located in the Western part of Uganda,marks the natural boundary between Uganda and the Democratic Republic of Congo. Rising water volumes sparked off by melting glaciers in the Rwenzori Mountains, poor farming methods upstream, overgrazing and population pressure contribute to the weakening of the river banks which eventually burst depositing large amounts of silt by tributaries into the Semuliki river. This causes the river to widen on either side of the river causing land loss in either country. The influx of cattle in the in the area has also accelerated the problem. The animals drink directly from the river which weakens the river banks even further due to their large numbers. World Wide Fund Uganda Country Office (WWF UCO) working with Joint Effort to Save the Environment (JESE) a national civil society organisation, the District Local Government, Albert Water Management Zone and the communities are piloting a river bank restoration scheme to mitigate further damage. So far a 5.2Km river bank stretch has been restored through river buffer zone establishment and river bank stabilisation with local materials such as bamboo and water reeds. The buffer zone in agreement with the land owners is cordoned off to limit cattle grazing and other forms of land use which weaken the banks. Community structures have also been strengthened as evidenced by the functional water user groups, communities’ commitment in monitoring and ensuring the sustainability of the interventions. The pilot phase has registered significant success. Notable among others is the fact that some land owners have independently,without any financial support replicated the same techniques on their land to stabilize the banks. This is a sign of adoption and an indicator of sustainability. Further still more players,both government and civil society, are coming on board to replicate and scale up the interventions to cover more hotspot areas. 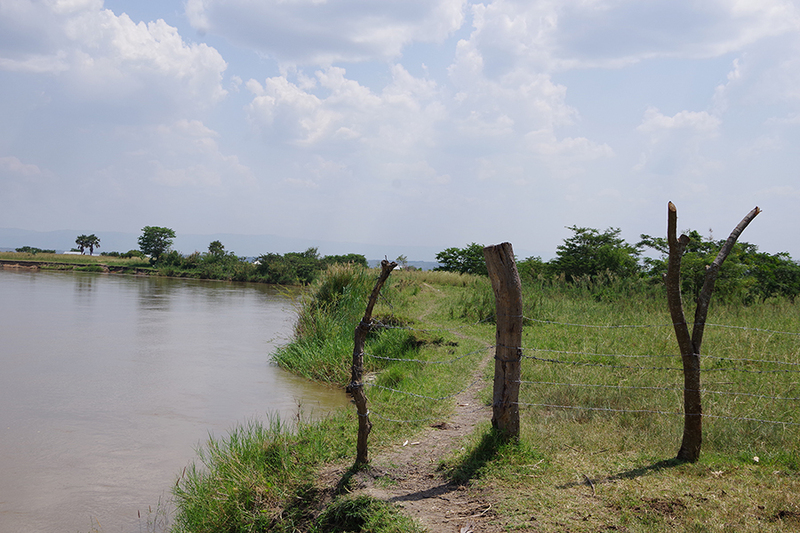 River Semuliki banks stretch restored through river buffer zone establishment and river bank stabilisation with local materials such as bamboo and water reeds.